Take your bowl of egg yolk halves and get mashing them up with a fork. They will seem dry and almost powdery. 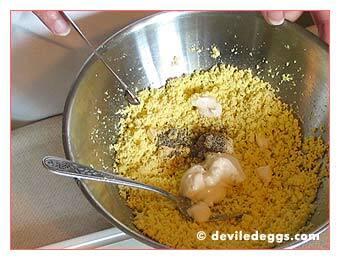 For nice, smooth fillings, mash the yolks well so that there aren't any large lumps. 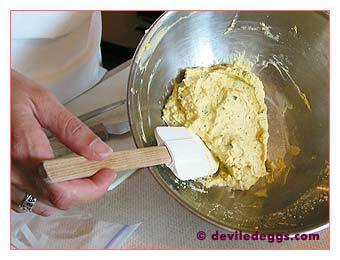 Most deviled egg fillings call for you to add all the rest of the ingredients at one time and mix well. You can still just use your fork for this, no fancy mixers needed. You'll need to mash everything together for about one minute. As soon as the ingredients are well blended and you see a nice uniformity in the mixture, you are ready to start filling your eggs. First though, a little discussion on the texture of the filling. 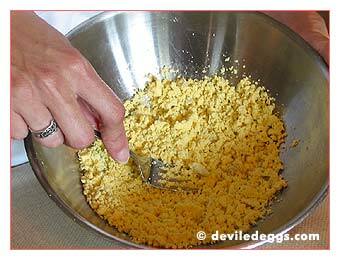 Here in this next photo you can see the texture of the eggs for the "Little Bit Devilish" Deviled Eggs recipe on my site. This texture is smooth and firm and pipes out of a cake decorator nozzle very well. It is preferable to avoid making the fillings too oozy as they don't hold much shape and will likely overflow the edges of the egg white when you try to pick them up. You'll find the recipes on my site have a firmer texture. I doubt you would want them drier. But to make them gooier, just add one extra tablespoon of mayonnaise for a little extra softness.